Celebrate someone's life with a book of LA Times front pages from each of their birthdays. It's time to celebrate a great moment in history--the day you were born! This custom-made, commemorative book is a treasury of the historic events that have crossed the path of you or an honored gift recipient. To start with, the timeless, hardback binding comes with the recipient's name embossed in gold on its surface, as well as a custom-printed dedication on the title page. Inside, the book contains reproductions of the front page of the LA Times, one for each birthday all the way back to the day you entered the world. Leafing through the pages gives a time-lapse view of a lifetime of history, from world events and global leaders, to changing technology and fashions. Opposite from each headline page is a page with room for the recipient to write his or her own personal experience of that year, along with photos and other mementos. It's a beautiful tribute that transforms the ephemeral matter of yesterday's news into something that will be treasured for years--or generations--to come. Made in the United Kingdom. This is a made-to-order item. If you order today your item will ship no later than 5/9/2019. I have not yet mailed to my sister, but everyone in my office is extremely impressed by this gift. What a wonderful idea. Even though the early (1939 - 1940s) pages are more difficult to read, they ARE readable. This is a truly unique gift that I believe will NOT lay on the shelf unread. Interesting to go back in time at a specific date every year. I didn't realize it was going to be a long book. Great great gift for the News nerds out there!! My dad has called me daily to tell me about all the things he's learning from this book. So many amazing things happened on his birthday each year that he never knew about. The customized birthday book was a gift of memories. Not only does it have the latest news each year on the specific date, but also has a place for you to add your own memories of that year's birthday like a scrapbook!!! Best Present for Anyone who loves the news! Great Gift for a Milestone Birthday! This was a beautiful quality book. It even included the birthday from just a couple of weeks before I ordered it. Great Gift for a "Special Birthday"
I gave this to my husband at a surprise birthday for his 70th birthday. He and his friends all thought that it was an amazing and special gift. The engraved name on the cover impressed all. Everyone asked where I found it - and now all the guests have your website. It was definitely a hit! 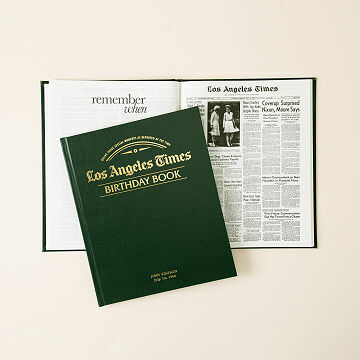 The LA Times Custom Birthday Book has a 20 page minimum, so only dates prior to today's date in 1998 or earlier can be ordered at this time. The most current date available is the date on which you place your order.